Yoga is a practice, art form, and tool to raise awareness. It is a part of the movement to help in the fundamental transformation of human consciousness. This begins with the individual and moves outwardly. This conscious transformation is moving toward the recovery of right-relationships and the restoration of our vital link with nature; the ending of wars outward and inward; of continuing to apply social justice to all of our considerations of law and personal policy; recognizing the importance to end prejudice of all kinds; and healing ourselves and our Earth. We honor humor as the gateway to the experience of wholeness of the heart, soul and psyche. It benefits the function and wellness of a whole, integrated, healthy, peaceful system. We will exercise our ability to laugh at ourselves, and not to take ourselves so seriously. There are many challenges to being alive in the new millennium. To function with humor in the face of modern life is the greatest gift. The YSK is dedicated to our being in touch with this lightness of being. Friendship is a key to the teaching. We're all eye to eye. No one expects devotion; this may even be a detriment if expressed in an unrealistic way. But a dedication to the whole---friendship, humor, focus, soul, sacred, attention, hard work, the ability to observe one's fears and being able to look at our own insecurity, violence or anger, ability to communicate on soul/psyche, verbal/nonverbal levels (listening skills and a good attitude are non-verbal skills)---are essential. One never arrives at a later date in the future. Life is arriving, being here from moment to moment. Graduation is a rite-of-passage but also a beginning. In every yoga lesson, whether your own personal lesson or one you receive, you will find, is this quality of returning to the beginning. Phony spirituality or ego trips are unnecessary diversions taking us all away from the truth. Spirituality is an ongoing, unfolding, in the moment gift that comes spontaneously, free of effort or desire. It is not a place in the future. YSK teachers are sensitive and aware. When you rely on this School to teach you the art of complete, balanced exercise, meditation, peace and well-being, be genuine, open your heart and mind. It is helpful for one to be open to analysis, critique and review. Talk immediately about your feelings. 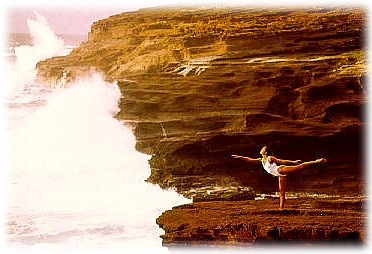 Yoga psychology: Our psychological nature is integral with the physical body. We store information from our memories everywhere. The hatha yoga (physical yoga) process opens our physical channels to be observed by the logical, cognitive side of our brain and being. In yoga sessions with you, you will be encouraged to open these channels so that your physical and mental bodies can work together to release and heal on very deep, cellular levels. This will happen with or without guidance. If you are open to the guidance, your processing of "old stuff" will undoubtedly move more quickly. This is a beautiful, healing process of well-being, and deep peace. This leads again to the importance of humor and laughter. I would rather see someone come into his/her own not really understanding what is going on, in an innocent way, free of fear, willing to goof-up, willing to make a mistake, willing to laugh at oneself, than to be a cardboard imitation of some image of a yogi. This pretension is counter productive. Humor is the greatest healer. It nurtures us. The vibrations of laughter heal us of ills, physical and mental, psychic and of the soul. Being able to laugh at the self is a part of the ability to laugh from the gut. Also, to see humor in life is a meditation in the sacred, unfolding moment. One is in a meditative state when laughter is occurring. Be free to explore your own hidden humor quotient. 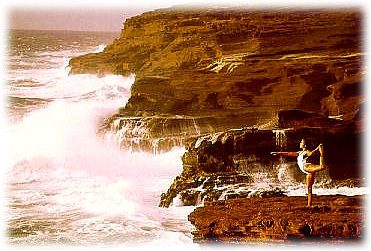 Creativity is always encouraged in the Yoga School of Kailua. Unlike a hierarchical system in which dictates and rules are applied to some rigid form, we are a creative school which is always changing; as you and I, and the universe around us are always changing. There is a particular "style" that you will be introduced to, but creativity within this "style" will be attended. This creativity is a movement in life to access one's sense of humor, to stay in the present moment, to prevent dwelling on problems you cannot solve; or not solving the problems you can solve, etc. Of equal importance is the philosophy. The mental, psychic, sacred, and soul part of this great art moves in tandem with the rest: the exercise and hard work. Readings and writings will be encouraged on a weekly schedule and your personal interest. This may seem like a disciplined regime. It is, certainly. Discipline, from disciple, means to learn, to comprehend, to take apart completely, and to hold. The words above, that you have just read are not complete, only a starting point. Take it seriously but not too seriously. This work is full of paradox. You will learn all about this. It will also be the most fun and most gratifying experience of your life. As we begin the 21st century, it will be apparent that the work we are doing will be fundamental in helping to save people from poverty of the spirit, which is a rapidly growing dis-order in communication/industrial society. This dis-order is affecting the health and well-being of all species on this small planet. Good planets are hard to find. We must share in the care of this one. Remember, too, there is a universal exponential movement in spirit, of which you will be a part, and are probably already a part. Cherish this thought. Also, of equal importance is our recognition and healing of the continuing move by humans away from Nature. We are Nature and Nature is us. There is no separation. Your role is essential to personal healing, well-being, and peace of the planet we share as our spiritual home. This applies to all of our relationships. Our human trend is toward an Earthnocentricity---Earth-human-centeredness---we forget we are a part of a vast unthinkable universe and we just dwell "down here," forgetting our link with the rest. Wake up. We are the future inhabitants of a consciousness aware of its place in the universe. Remember, "if it ain't fun, better left undone."